There is a posting in the Arcadia that described a camp of some sort in Cargando in need of unspecified aid- a wizard hired by them was waiting in the marketsto teleport sellswords there. Fresh from their last excursion to a mine, the party decided to accept the job and headed off to the markets where they met an old wizard with salt and pepper hair. The wizard explained that he understood the camp to be a group of nobles on safari. The wizard teleported them into the middle of a mercenary camp of mixed giant and giant blooded races like Ogres and Trolls surrounded by a blasted landscape under a hazy sky. Orcish zombies worked at a forge, mindlessly hammering away at heated iron, or carrying supplies. 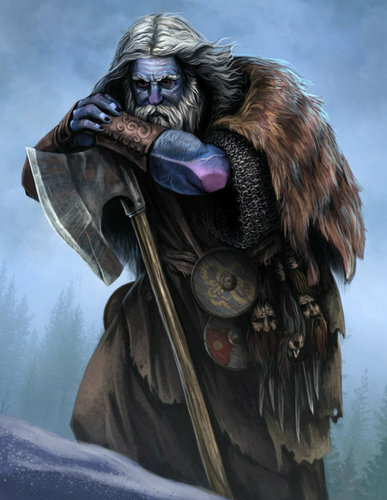 A frost giant with large amounts of jewelry "welcomed" them to his mercenary camp, and informed them that they were in the Godscar, and that the wizard did what he was paid to do. He introduced himself as Klugheit, honored and esteemed Blackguard, and leader of the mercenary camp -he said he made no apologies for his deception, but if they but stayed awhile and listened, there will be much gold in it for them. He informs the party that he put one of his membership in charge of a small camp training new hill giant recruits -an ogre, Orgoth "The Relentless". One of the new recruits returned from that camp and told this tale: After returning from a training exercise in the wastelands, Orgoth became insane in ways no one could understand, it was not battle-madness, the rage that their god praises but something different-and Orgoth should have been of greater mind-strength. Orgoth snuck off at night and returned covered in blood with no memory of where he had been, but from the tales told by neighboring tribes of ogres, it seemed he had unknowingly snuck off in the night to stalk, kill, and cannibalize them. This worked completely against their goals-for they venerated Koschtchie Great Demon Prince of Wrath. His priests preach that he is the true father of the giant race and that all giants and those of giant blood that do not worship must be reclaimed, and unified-or destroyed. Klugheit, had established this mercenary-cult to create brotherhood among them, draw them with the allure of gold and keep them with the glory of Koschtchie. If the neighboring ogres knew that one of Koschtchie's cult was hunting their tribe, they would never join. Fortunately, the neighboring tribes had not spotted their assailant so as to identify them, and the recruits did the right thing, proving their war-worth by subduing him, they were all promoted. A replacement was sent along with more new trainees, along with a healer to assess what madness had befallen him. However, Orgoth suddenly underwent a terrifying transformation unto some more beastly form, and sped off into the wasteland with god-like speed leaving a trail of fire and smoke. They speculated about what he might have become. Orgoth was a warlock, and they knew little of what their ilk was truly capable of-for their powers are of the weird and supernatural. Perhaps he had called something up and become possesed? They did not know. But it was not long after that they were attacked as Orgoth returned later that night from wherever he went, swooping down upon them a a bird of prey he harried them with rending jaws-tearing the healer apart- but not before they swiftly took his head. They knew it was him not so much by his warped face but by the Vile Brand on his chest, that all officers of their company earn. They buried him on the spot, covering his body with stones and thought the matter was resolved. It was a few nights later that Orgoth returned-just as before even though his grave was undisturbed. Orgoth lived up to his title, and killed all save a single trainee who fled rather than fighting to the death. Klugheit, thanked him for this information-and for it spared the trainee execution, only torturing him instead for his weakness. His feet were cut open and the bones plucked out, before they were healed shut leaving him with useless bags of flesh upon which to crawl since he was so eager to run. Klugheit, did not know exactly what Orgoth had become, albeit -he could say it was a thing of true darkness and fury. As a Blackguard he could not willfully destroy such a thing, for it embodies all the virtues he stood for. However Klugheit, needed someone who could put Orgoth down for good, lest Orgoth spoil his cults plans to recruit the neighboring Ogres and others by being identified. There was rumor now of a beast, which was surely Orgoth. If Orgoth were only killing orcs, or elves or anything else Klugheit would be just fine with it-but Orgoth was wild now and could no longer be controlled. Klugheit could not willfully order any of his men to kill him if it might be done, nor would he dare "hire" anyone to destroy a truly evil creature for it was against he vows. Instead…he brought the party to the Godscar to "inform" them of Orgoth's existence, and the area of the wasteland he had come to haunt and that Orgoth's funds were still there in that abandoned camp -though the warped ogre would surely hunt them were they to go after it. "IF you can kill Orgoth and bring his remains before me , and for three nights it does nothing more than rot, then I Klugheit, will respectfully acknowledge your war-worth, and will have one of my ogre mages send you home. Otherwise…you can look forward to wandering in a land of savage hordes with every evil from bodaks to zombies longer than you'd like, until you find succor"
Faced with their situation, the party reluctantly agreed -but they wouldnt leave without a map. Klugheit supposed that giving them a map would only be a venial sin, and one of his lieutennants joked in abyssal "A sin? How do you know you are aiding good, rather than sending them to their doom?" Following the map and using the supplies they had the party traversed the dusty plains for 3 days and nights before they were caught in a choking sand storm that would kill them if they remained exposed for too long. Fortunately they found the camp, and nearby cave. Arielle suddenly heard maddening whispers in the wind that had she not resisted them would have robbed her of her sanity, and then everyone heard the wail that grew into a roar as some vaporous Thing became flesh and attacked! Julia was horribly wounded and would have continued to bleed quite badly if Cordy had not tended to her. 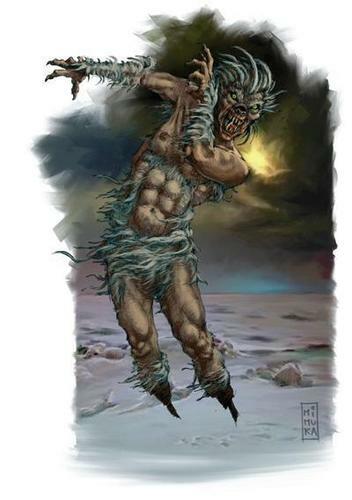 As the party entered battle Arielle identified the creature as a Wendigo, natures anger and fury incarnate- an evil fey with the ability transform others into its own through magical disease. The creature proved to slow and was unable to retaliate before the party dealt grieveous wounds in vengeance! Struck at the wounded Julia again before it assumed its insubstantial form. The party fought on and managed to strike a blow that returned it to its solid form and put it down -if temporarily. Arielle knew it could regenerate, and that without fire they would never it down permanently! Kelvin was able to find some torches and get them to light in the high winds, cauterizing the wounds, before fleeing with the others to take shelter in the cave. In the back of they cave they found a small chest half buried, and many platinum coins within! The creatures body brought back to Klugheit and having heard the pary's tale he would likinen what Orgoth had become to his trolls, and thus would he was assured that it was destoyed by its cauterized wounds. He acknowledged their war-skills, admitting the strength of the light-but not before reminding, them that one night darkness would surely reign eternal. Waiving his original three day waiting period, he commanded his ogre mage to send the party off to Avalon, and out of his sight. +KelvinDragon arms still crossed, staring silently off at the horizon. His jaw remained clenched, biting his the insides of his cheeks to remain silent should he really tear into these evil creatures. +Darrion would look around "Well I see….we will confer about this" he would turn to the others, his face was rigid with anger right then but tries to keep calm. +Cordy trembles as she takes a shaky breath. "F-first off… r-remove all t-thought of a-attacking them… he is n-not one we w-would s-survive… a-and t-they aren't g-good…" she stuttered nervously as she wrung her cloak nervously, "B-but it is w-wise not to a-anger h-him… I t-think…"
<+Ariel_Seolla> And than kelvin died. 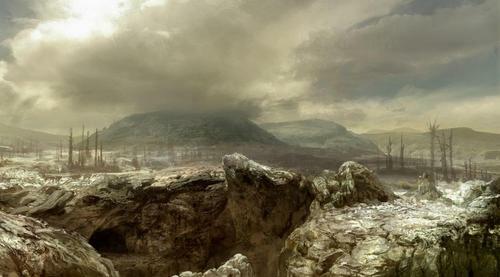 <+GameMastaTam> You enter the wastelands, map in hand in the direction of the camp. The map is not of the utmost quality cleary drawn by a troll or ogre cartographer who could draw about as well as a 2nd grader and write just as legible in bastardized common. But…it seems good enough. <+KelvinDragon> The map is in crayon. <+KelvinDragon> When I was in kintergarden, I used to eat crayons. >.> But only green ones. <+Ariel_Seolla> Did nobody ever wonder why there were never any green crayons? <+KelvinDragon> I do remember getting caught though. It was the middle of the year, around Christmas and the teacher had us organizing our desks.. she went to mine, opened it and found a pile of green crayon wrappers. <+Ariel_Seolla> "Why are all the trees brown?" "Nobody has any green crayons." Navigating OR I'm a Ranger IRL! <+KelvinDragon> Basicly you collect an armful of sticks or other markers. As you travel, you stab them into the ground leaning in the direction you're traveling. Look back as you stick them in, and make sure you're in line with the tilt. That way you won't lose your bearing. * +KelvinDragon is full of useful advice. * +KelvinDragon also has occasion to be full of other things. Such as pizza. <+KelvinDragon> People have been using the sun to determine direction for years. <+KelvinDragon> Well if you take a stick and put it in the ground..
<+KelvinDragon> And mark where the shadow is at. <+KelvinDragon> And then wait fifteen minutes and mark the shadow again, you can determine east-west. <+KelvinDragon> If this isn't the guy we came for..
<+KelvinDragon> Is this thing undead? <+Ariel_Seolla> It is filled with precious pottery, you destroy the treasure!